Nominee Leslie Jones attended the 70th Primetime Emmy awards on Monday(September 17th) at the Microsoft Theater in LA. While some designer's are hesitant to lend or do custom pieces for Leslie, the fashion marriage between her & CHRISTIAN SIRIANO is a great one. 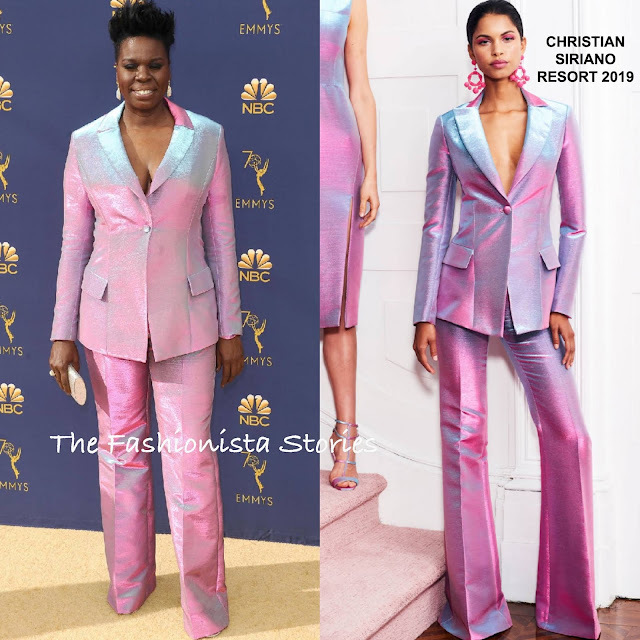 She was definitely a standout in Christian's RESORT 2019 pink iridescent suit. The color looks great on her and I like the futuristic vibe of her suit. JORDAN ALEXANDER jewelry, a JUDITH LEIBER clutch and smokey eyes rounded out her look.